Philadelphia 76ers center Joel Embiid (21) reacts after a foul call during the second quarter against the Toronto Raptors at Wells Fargo Center. Joel Embiid did his best to make it a game all by himself, but the Sixers just didn't have enough to compete with the Toronto Raptors. An exciting fourth quarter masked what was otherwise a poor performance for the home team, and the Sixers ended the night losers in a 119-107 defeat. Embiid can hold his head high after that one. Here's what I saw in Tuesday night's game. • The Sixers looked dead in the water after 24 minutes of basketball. All it took was a little foul trouble for Serge Ibaka to junk up what the Raptors were doing. What will fallout of John Wall injury be for Sixers? You can credit one guy for accelerating that problem. After Ibaka picked up his fourth foul early in the second half, Joel Embiid immediately went down the floor and demanded the ball, taking it right to Ibaka's chest to draw his fifth. It's the sort of thing we've seen him do before against guys like Andre Drummond, and it sparked Philadelphia back to life. With the likes of Greg Monroe guarding him, Embiid had an absolute field day. Embiid forcing himself to the line in the second half was arguably the reason the Sixers hung around in this game despite having no business sticking around. It slowed the game down, it put points on the board, and with their franchise big man trying to drag them back into it, the crowd rose from their slumber, giving the Sixers a boost of adrenaline in the fourth quarter. Being a great player is about production and performance, but it's also an understanding of when and how to seize the moment. Embiid is at a point where he understands that, and by forcing Ibaka off the floor early in the third, he started a domino effect that allowed them to scratch and claw their way back. The guy has been a pleasure to watch this season, and he took on a huge minutes load on a night where the team couldn't afford him to sit much. He should be firmly in the MVP conversation. • Ben Simmons did a much better job coping with Kawhi Leonard on defense than Jimmy Butler did, let's put it that way. • What the hell got into Mike Muscala in the third quarter? Philadelphia's backup big man is typically a stationary shooter for most of his minutes on the floor, but he was aggressive cutting to the rim in the third, and the Sixers rewarded him with dump-off passes that led to points and free throws for Muscala. Muscala shot seven free throws in the third period alone, a number he typically would struggle to reach over a period of several games. • I didn't think the final score was representative of how outclassed the Sixers were for a lot of Tuesday evening. I was half expecting to look up at the scoreboard and see them down by 35 points at different times throughout the game. Even when they went on a spurt early in the third, they made all of five points back while playing Embiid for seven-plus minutes to open the quarter. You can't really say, "They don't beat good teams!" after watching them beat the Warriors (and when they're playing without two starters), but it was disappointing to see them outclassed by the Raptors yet again. The only time they've beaten Toronto this year was with a bunch of Toronto's main pieces out. That doesn't bode well for the playoffs. The game certainly speaks volumes about how good Embiid is, at the very least. • Kawhi Leonard junks up a lot of things the Sixers like to do. And really, that comes down to how miserable he makes like for Ben Simmons, who can not seem to figure out what to do when Leonard is on the floor. A lot of teams choose to concede the perimeter to Simmons in order to pack the paint and take away the only area where he finds success as a scorer. This can sometimes backfire when it allows Simmons to build up a head of steam and either finish or dish from the paint. Leonard's combination of strength, size, and speed allows Toronto to play tight coverage on Simmons without any real repercussions. He gets Simmons out of his comfort zone and it ends up bogging down the offense, which is not exactly wonderful in a halfcourt setting as it is. 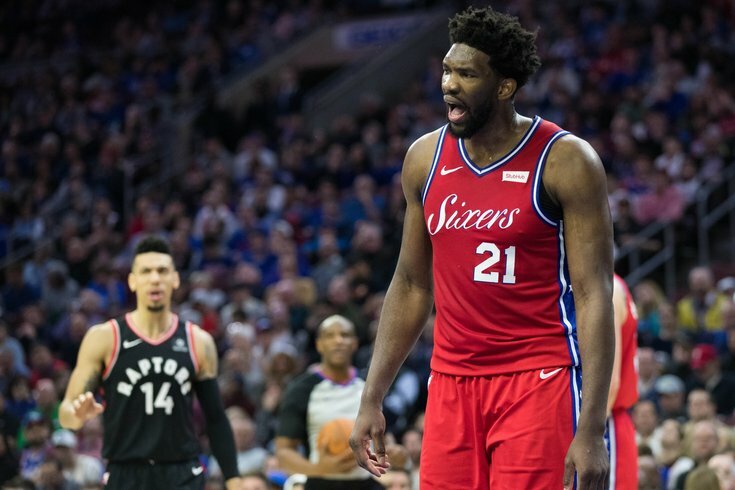 • I don't think effort is typically an issue for the Sixers, but they've had a few too many moments recently where they didn't finish off plays and it came back to bite them. There was a sequence at the end of the Kings game last Saturday where Ben Simmons stood flat-footed as the Kings played volleyball and effectively killed off the game. Philadelphia lost out on a couple of those against Toronto, which compounded the rest of their problems on both ends of the floor. The Raptors beat them to loose balls, including on a play where Delon Wright tossed up a prayer while falling out of bounds, finding Serge Ibaka wide open under the basket with the Sixers assuming the play was done. Good teams don't let you get away with that kind of stuff. The Sixers can't change their personnel limitations, but they can control their compete level. Once they turned it on, they were right there. • Jimmy Butler is able to produce steals and run outs by cheating off his man and poking balls away from unsuspecting players. The Raptors are not the team to do it against, because if you double off their open shooters, they have plenty of guys who will either make you pay from deep or will attack the closeout with style. Let's be clear about something, by the way — Butler is and has been overrated on defense. He makes enough plays every game and is good enough when the effort level is turned up that he can be a difference maker when he wants to be. But those stretches are few and far between, and he's not on a team where he can afford to turn that switch on and off so frequently. • A cataclysmic performance from the bench, though I'm not sure they should have been expected to do much, given the competition. T.J. McConnell threw a few passes where I questioned if he may have been drinking at halftime, Furkan Korkmaz was a traffic cone on defense, and Jonah Bolden's hyperactivity hurt him against a disciplined team. Toronto's bench is, was, and will be much better, so what can you do? • The Sixers are limited by the injuries they're dealing with and the roster they have in place, but in a game where the Sixers were doing 18 heading into the fourth quarter, Embiid, Simmons, and Butler had all played 30+ minutes. Embiid and Simmons ended up playing 40+ in a loss. They have two days before their next game, but good grief. • Losing JJ Redick to a bout with nausea before the game even started was not ideal for a Sixers team already missing one starter. We haven't really gotten a true look at this matchup this season, with guys either out for either team or coming off of a back-to-back. • Holy Toledo, were the officials terrible in that game. They certainly didn't cause the Sixers to lose — and one could argue the way they called the game helped keep Philadelphia in it — but they did a horrific job of identifying calls all night. Players on both teams picked up infractions for hitting air or being grazed by an opponent, and a call on Landry Shamet in the closing minutes turned a potential four-point play into a foul the other way, which was one of just a handful of game-changing decisions they made throughout the night. They sucked big time, and that's all I can really say about that.